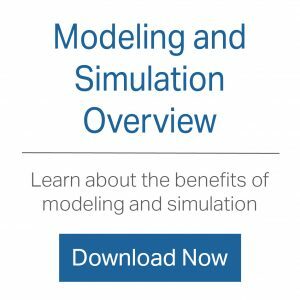 Depending upon the question or challenge you are attempting to address, our modeling team has a number of tools at their disposal including 2D and 3D simulations, spreadsheets, flowcharts, warehouse sizing and emulation – all designed to help you analyze, predict, and improve the performance of your system. You can quickly recoup the investment of a modeling project by making changes that ensure your facility or line is operationally faster, smoother, safer and more economical. Simulation, while it may appear simplistic, is a powerful tool to test, understand and optimize a process or packaging system. Process simulation can help determine appropriate sizing for tanks and flow rates, allowing us to recommend and procure tanks that are perfectly suited for the application given a variety of parameters. Packaging simulations incorporate machine speeds, failures and recoveries, scrap rates, and other inputs affecting line performance. It can be used to size buffers, predict throughput and compare overall performance of different layouts and scenarios. Process and packaging simulations can be connected if appropriate. Validating your PLC program in a virtual environment makes the transition to the facility more seamless with better quality and faster start-up. The models are connected to the tags in the PLC, which is in turn connected to the HMI. This allows us to interact with the HMI and see real-time results in the model. At the conclusion of testing all scenarios we have a Factory Acceptance Test (FAT) for our control system.